Aloe vera is a type of plant called a succulent, which means that its leaves are thick and fleshy so that they can store water and so the plant can survive in dry environments. The aloe plant probably first evolved in northern Africa, although today there are no naturally wild populations. This fact has led botanists to believe that the plant has its origins as a hybrid. Other species of aloe plants do grow wild in Africa and the Middle East. The thick leaves of the aloe vera plant are tapered to a point at the end and serrated along the edges. It produces yellow flowers on tall stalks in the summer. Aloe is a common house plant, and is easy to care for because it requires little water. It is also popular in landscaping, especially in dry climates. If you have any aloe plants, you have probably noticed that if you break open a leaf you get a clear, gel-like substance. This is the essence of the plant, and the part that is used medicinally and as a superfood. The first recorded use of the aloe plant for medicinal purposes dates back more than three thousand years to a papyrus from ancient Egypt. In several different cultures and for thousands of years, aloe has been used as an ingredient in foods and drinks, as a topical ointment to soothe burned or itchy skin and rashes, to stop wounds from bleeding, to soothe sore throats, and more. Today, people are rediscovering the many benefits of this beloved houseplant and realizing that it can do much more than just soothe sunburned skin. Vitamins and Minerals. The gel of the aloe vera plant contains several different vitamins and minerals, including vitamins A, C, E, B1, B2, B3, and B6. It even has vitamin B12, which is found in very few plants. This makes aloe a great supplement for vegans who otherwise have a hard time getting this vitamin from non-supplement, whole-food sources. There are also 20 minerals that our bodies need in aloe gel including calcium, copper, chromium, iron, magnesium, manganese, potassium, selenium, and zinc. Essential Amino Acids. 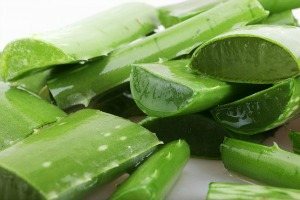 Another reason for vegans and vegetarians to get more aloe in their diets is the protein content of the gel. Meat and dairy contain all of the essential amino acids, those building blocks of proteins that we cannot make ourselves and must get through food. Most plants do not have all of them, but aloe is an exception. Digestion. One of the most common reasons people use aloe vera, after topical relief, is to aid digestion. For thousands of years, aloe gel has been used as a laxative. Today, we know that compounds in aloe called anthraquinones are responsible for the laxative effect. The interesting thing about aloe for digestive issues, however, is that it can help with diarrhea as well. It adapts in your digestive tract to regulate your bowel movements as needed. Aloe has even been shown to bring relief to people suffering from ulcers, Crohn’s disease, and celiac disease, all illnesses with painful or uncomfortable digestive symptoms. Detoxification. As that gel moves through your digestive tract, it not only helps to regulate your functioning, it also absorbs and removes toxins. Aloe can act as a great natural detoxifier and cleansing agent. Immunity and Cancer. Some of the most exciting research about aloe vera gel is in the realm of cancer and immune system function. The polysaccharides, or long-chain sugar molecules, found in aloe seem to help the immune system work more effectively. They also destroy cancerous tumors. In studies with patients battling cancer, those who were given aloe every day were more likely to live longer and to survive their cancers than those who were not. Diabetes. In several different cultures throughout the world, aloe is a traditional medicine for people with diabetes. The gel helps to stabilize blood sugar levels. It also improves circulation, which can be beneficial for diabetics suffering from numb hands and feet, a symptom of the illness known as neuropathy. Inflammation. Researchers are beginning to discover that chronic inflammation in the body may be at the root of many illnesses, including heart disease. Compounds in aloe gel have been shown to reduce inflammation. It can be used topically on joints to help relieve arthritis pain, but can also reduce overall inflammation in the body when consumed on a regular basis. Cholesterol and Heart Health. When taken internally, aloe vera is known to lower both cholesterol and triglyceride levels in the blood. It also helps to improve circulation of blood and lower blood pressure. All of these have positive impacts on hearth health and help to reduce the risk of heart disease. Skin Care. Everyone knows that aloe is good for the skin, but do you know how many ways in which it can improve your skin’s condition? Aloe is great for hydration and can be used as a moisturizer and rejuvenator. It improves the elasticity of the skin by repairing collagen and increases blood flow to skin cells. Aloe gel also helps wounds and burns heal quickly and it reduces the pain and discomfort of wounds, burns, but bites, and rashes. Some of the compounds in aloe, sulfur, salicylic acid, cinnamic acid, and others are antibacterial, antifungal, and antiviral. How can I use my aloe house plant in my smoothies? You can buy powdered aloe and aloe juice, but the best way to use aloe gel is fresh from the plant itself. You can grow your own indoors or buy leaves of aloe from specialty and health stores. To get down to the gel, you have to filet your aloe vera leaf. This simply means cutting away the outer part of the leaf, which is green. It may take some practice to do it well. Start by cutting the ends and sides with the spines away. Then use a sharp knife to slice away the flat sides. You should be left with a clear, slimy, gel-like filet of aloe. Are there any risks associated with eating aloe? Aloe vera gel is considered safe for most people, but it is a potent substance and you do not need to eat a lot of it to get the benefits. Always talk to your doctor before trying any new medicinal product. In the case of aloe, especially discuss eating it with your doctor if you are pregnant, have kidney disease, or you take diuretics. There is a possibility that taking too much aloe can disrupt the balance of electrolytes in your body, which may affect the course of these conditions. Some people get their aloe dosage each day by drinking the juice of the filleted gel. You may try it, however, and find you the flavor does not agree with you. Aloe gel is mostly tasteless, but may have a bitterness to it. It also has a slimy feeling that coats the inside of the mouth that many people find unpleasant. This means that blending aloe gel into your next smoothie is the best option. For all of my smoothies featuring this awesome superfood – aloe vera smoothie recipes. I’d love to hear about your experience with aloe vera – please do tell in the comments below. Your local health food store should carry aloe products. If you want to purchase online, I recommend Mountain Rose Herbs. Lately, I’ve been using this Aloe Vera Gel, which is affordable and easy to use compared to filleting fresh aloe. I love this Strawberry Aloe Smoothie recipe, I’m a fan of anything aloe-vera! It works great for skin. I am going to try this soon. Hey Anna, let me know how you like this smoothie after you try it. Aloe is definitely awesome! Thank you for this smoothie combo, in the past I have used aloe with mango and green tea in my blender and your right getting used to cutting it does take some time I usually keep a little warm soapy water in the sink to free my fingers of the goo. LOL! Which aloe vera should you buy, powder or other one? I recommend aloe vera gel products or actual aloe vera. I hope you enjoy them, Nwad. Just this I had my first try ever to aloe vera (ingested). It took me all but a minute to fillet it, and I used my Ninja to blend it with half a cup of water, a quarter of a cucumber (with the skin but no seeds), a cup of freshly diced pineapple and half an apple. Once juiced and poured in a glass, I squeezed a couple drops of lime juice. Et voilà! Super refreshing, cleansing, cholesterol washing! Sounds delicious! The cucumber was a nice touch. I normally cook the aloe Vera. Do we get the same benefit as eating it raw? Yes, the health benefits nearly identical, SooLee. Did you know that Aloe Vera contains the highest amount of naturally occurring ORME (Orbitaly Rearranged Mono Atomic Element) more commonly known as “White Powder Gold”. Black grape and Carrots come a close second and third. I have taken AV and Black Grape juice since 2004, some of the effects were quite startling. I did not know that, Mike, nor am I familiar with ORME. I’ll have to look into it. Thanks. Very good, and you’re welcome, Priscilla. I’m so glad to hear so many health benefits, I just thought I was doing something good for myself. I grow Aloe Vera & put the gel in my smoothies then rub it all over my face while it’s blending…l glow !! I blend, kale, coconut water, paw paw, natural yoghurt, aloe gel cut fresh out of the leaf, for lunch every day. It is yummy & helped me lose weight and gain energy & vitality. Fantastic, Sherry! Sometimes learning about the health benefits actually increases them – mind over matter. In 2014 I was diagnosed with leukemia and my grandmother made me a smoothy of aloe vera fresh from my home with: onion,garlic orange,grape fruit and lemon which I had for 2 weeks everyday. The results were so surprising to the doctor and I also gained weight and felt much better up to today!!!! That’s fantastic, Edith! That smoothie is a unique combination of potent and healing foods, which I’m not surprised improved your condition. For smoothies like the one above: 1/4 cup of filleted and diced aloe gel or 1 tablespoon concentrated aloe vera gel. Otherwise, I would stick to what the aloe you purchase recommends for quantity. Thanks for all the wonderful information, try the smoothie recipe and love the taste I added marine protein and oatmeal. Delicious!!!! Nice to hear you found this smoothie delicious, Maria! I like the protein powder and oatmeal additions. Is the Marine Protein Collagen?